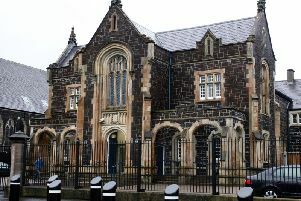 A Larne man charged with taking a fire engine on a rampage causing “£1.5million” damage to houses and vehicles in the town has admitted breaching a bail curfew by nipping outside for a smoke, a court heard on Saturday. Robert Duffin (67) originally of Green Link in the town, is accused of leaving a trail of destruction on March 5 last year. He previously denied charges and his case is next due to be mentioned at Antrim Crown Court in May. A co-accused, Ross Clarke (19), originally of Fairway in Larne, has already pleaded guilty to a catalogue of offences arising out of the fire engine incident and is awaiting sentencing. And also at a previous court there were claims that at one stage the driver was told not to go down a street because it was one-way and on another occasion the fire engine stopped at red traffic lights. During the rampage the fire engine careered out of control at Larne’s Glenarm Road causing damage to the vehicle, the fire station, vehicles and dwellings. A police officer told a court last year Duffin had a “fascination with blue lights”. Duffin’s lawyer Stephen Law told a hearing in 2016 the destruction caused was like a trailer for the next ‘Hangover’ movie. Duffin appeared in the dock at Ballymena Magistrates Court on Saturday morning charged with breaching his bail. Defence solicitor Archie McCormick said the breach was accepted and a prosecutor said they were not making any application to remand Duffin in custody. Mr McCormick said Duffin had been on bail for over a year and said the breach, which occurred 15 minutes after his 10pm curfew, was accepted. Being outside triggered an electronic monitoring unit. The solicitor said Duffin was outside his property having a smoke. District Judge Liam McNally said the breach was “minimal” and he was not revoking bail but warned Duffin not to have any further breaches. Judge McNally told Duffin: “You are better going off the smokes, or smoke in your own house”.